I have to admit not having much Sri Lankan food in my lifetime but Aldi’s Specially Selected Sri Lankan Soup does peek my interest. 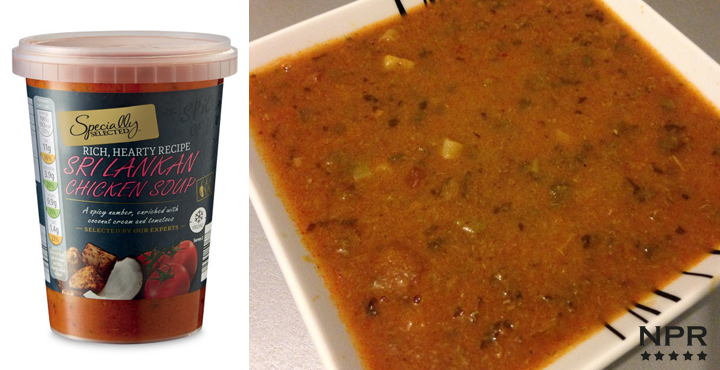 Sold in the large 600g tubs, this soup is semi-thick and covered with bits of herbs, very small chunks of veg and no noticeable chicken pieces and as you would expect has a spicy aroma. The first taste is that of a rich curry that has an abundance of flavours with a low-medium spice background with a herby and oniony taste. Its like a thin curry soup and there are very minute strings of chicken(that sometime feel like small hairs) that pop up in your spoonful but don’t really add to the flavour but just add to the texture. The aftertaste is less curry like and more Asian, tomatoey, vegetabley and somehow(contrary to what I said previously) meat like in taste, in a low/medium spice aftertaste. They are strong flavours, this is in no way bland at all, and has multiple different tastes as you consume it. Overall, I am not a big spice lover, and while this does have spiciness, its very tolerable. I quite like this soup but I couldn’t eat a lot of it, a small bowl, bread and butter and that would be great. And apart from the sometimes stringy/hairy chicken, its a good quality spicy Indian/Sri Lankan soup that is packed with flavour.